I lived in Beijing for 3 years, so have a lot of friends and former colleagues there. And with a bit of extra time in my schedule, I decided to consider taking a week to catch up with my former life in Beijing. Spring isn’t the best time to visit, because there are often dust storms, but it’s also not a terrible time to visit because it isn’t too hot there yet. Naturally, I default to using miles and points for trips rather than cash, so I went ahead and put a decent itinerary with American Airlines on hold. However, I really don’t enjoy flying them. The cabin configuration in economy class is more or less intentionally miserable. Also, if you book inside of 21 days with AAdvantage points, you have to pay a close-in booking fee. I could avoid that by using Alaska points, but Alaska points are so valuable for other flights that I really hate to burn them on American flights at the same redemption rate. So, I decided to check cash fares. I like using Momondo, which often uncovers cheap fares. However, I wasn’t really prepared for just how cheap the lowest fare (by more than $200) was: $479. Of course, this wasn’t a nonstop flight on a well-known airline. It wasn’t even a one-stop flight on a well-known airline. It was a two stop flight with a forced overnight on the virtually unpronounceable Xiamen Air. Of course, a forced overnight wasn’t really a great deal if I had to pay for hotels along the way. China is a surprisingly expensive destination and hotels would cost me a minimum of about $50 overnight. 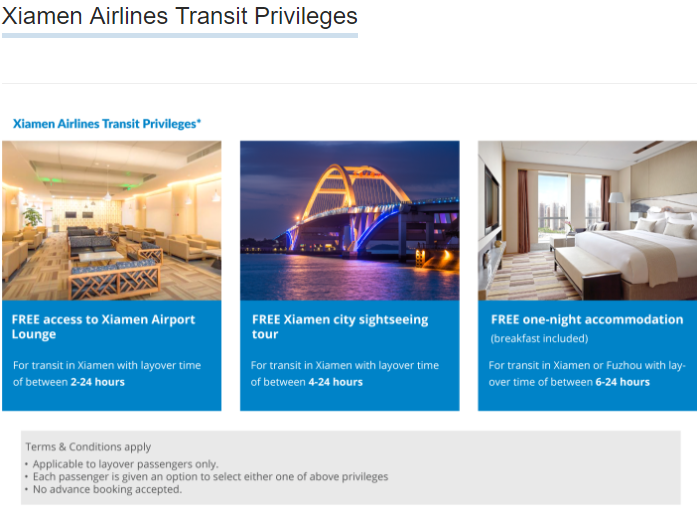 However, Xiamen competes with Hainan Airlines, who provides free transit hotels for people who get stuck with a forced overnight in Beijing. I thought there was a possibility that Xiamen provided transit hotels, which would make the all-in pricing competitive (and help to justify the two-connection, 29 hour itinerary required to fly them to Beijing), so I called their customer service number. The first time I called their customer service number, I sat on hold for a long time, and was abruptly informed by a recording that “we are busy at this time, please call again later.” The call then disconnected! I called again, and a very patient agent answered all of my questions. She was able to see the same fare as me, but not with the same routing. Instead, the routing would have had me leaving Fuzhou in the late morning and I wouldn’t have gotten to Beijing until the following afternoon (two calendar days, mind you, after leaving Seattle). On the way back, I’d leave Beijing late, arrive in Xiamen really late, and then fly out super early in the morning the following day to catch my flight in Shenzhen. This itinerary (and similar ones) was also available on the Chase portal, which would have allowed me to spend just over 30,000 Ultimate Rewards points for this itinerary at 1.5 cents per point. However, I kept searching around online travel agencies and finally found a somewhat better itinerary on the worst of them: CheapOAir. I really hate using this agency, because they don’t honor the standard 24 hour cancellation policy the airlines do (even if you made a booking 5 minutes ago in error, they still charge a $75 “agency fee” to change or cancel it). However, they are independent of Expedia and Priceline (the two companies that own the largest online travel agencies), and they negotiate with airlines directly. This means that they can get access to inventory that other travel sites don’t have. And in this case, their inventory–for the same price–gave me a much more reasonable (but still terrible) itinerary. However, she also stated that flights laying over in Shenzhen or Fuzhou would qualify. That being said, she wasn’t sure whether a hotel could be provided in Fuzhou on the itinerary she was contemplating if I changed to it in Shenzhen, because it would be considered a domestic flight. Is a transit hotel included? We’ll see. The ticket I bought is for the absolute cheapest economy class fare. It’s an “S” fare, which is so cheap that no mileage credit is awarded for it in any program. It’s so cheap that the paid fare was about the same as the fuel surcharge would have been if I had redeemed Delta miles for this flight. Basically, it’s so cheap that there’s no conceivable way that Xiamen Air is making money, even if they flew me there in a jumpseat attached to the airplane toilet door and fed me gruel with sawdust and only water to drink. Nevertheless, this ticket, on paper, qualifies for a transit hotel. I can’t wait to see whether I actually get it, or if I do, what it’s really like (I have stayed in some really awful hotels in China–will I become reacquainted with Zhang the Cockroach?). 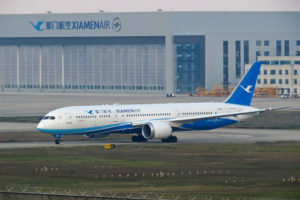 But at only $479, there are enough savings built into the itinerary that I can spring for a hotel along the way if I need to do so (if Xiamen Air is anything like China Eastern, I am pretty well assured that nothing promised–especially with as weak a promise as Xiamen Air provides–will actually be delivered). I did put the airfare on my Chase Sapphire Reserve, so there’s a possibility I could try to claim trip interruption insurance if Xiamen Air strands me (although this situation seems pretty clearly not covered, there are stories of people having success with questionable claims). Oh, and seating? I could select from any middle seat I wanted. This will be a true Seat 31B itinerary. I’m taking off May 5th. Stay tuned!